For Tel Aviv, technological innovation is at the heart of a destination-wide strategy aimed at creating a seamless visitor experience. The city is a hotbed for startups and innovative entrepreneurs, and its “Smart Tourism Initiative” is designed to stimulate tourism innovation. In doing so, Tel Aviv Global (a branch of the municipal government focused on raising Tel Aviv’s global tourism profile) also adds value to its industry by collaborating with local businesses that can benefit from the digital breakthroughs. As part of our Leading Thinkers series (featuring the insights of those who participated in discussions at Destination Think! Forum 2016), we spoke with Dr. Isaac Mizrachi, Tel Aviv Global’s Director of Tourism, to ask him about their approach to collaboration through technology. Destination Think! : Can you describe Tel Aviv’s “Smart Tourism Initiative” and how the project fosters online collaboration? Dr. Isaac Mizrachi: Tel Aviv is a real startup hub. We have about 1000 startups and for a tiny city of just 52 square kilometres, that is a lot. It is the Middle Eastern version of the Silicon Valley, so we tend to call it the “Silicon Wadi”. Many of these startups belong to the travel tech segment. From re-selling hotel rooms in Roomer to booking taxis with Gett or improving your museum visitation with Artbit, there is so much going on and we as a destination marketing organization (DMO) thought that we really have to make the most of it for the benefit of both visitors and the entrepreneurs themselves. We decided that we are going to support these travel tech startups in various ways, from giving them free working spaces, to exposing them to global media, and then integrate their products with the local tourism infrastructure. This is the Smart Tourism Initiative in a nutshell. For example, about 30 of the city hotels now use an app called Howazit, which is a customer communication platform that is made in Tel Aviv. We helped this product grow and now keep encouraging hotels to use it in order to better control their reputation management. What makes this collaboration around new technology valuable for your tourism industry stakeholders? Let’s be honest, most tourism businesses are very conservative. They don’t have the time to search for new technologies that will improve their daily work. We try to fill that gap by being the “tech mediator” that helps the local industry keep up with recent developments. For example, a few months ago, we were approached by the owner of a big hotel chain in Israel, who is now building a new urban hotel that is aimed at millennial travellers. He was looking for ideas on how to make the place cool and hip. We suggested that he create the first smart hotel in Tel Aviv, where everything from check in to check out is done using tech products that are made in Tel Aviv. So it also has a local element to it that we love at Tel Aviv Global. He liked the idea and we organized a meeting for him with 10 selected startups that matched his needs. He progressed with a few of them and was very thankful for us. How will the efforts to turn Tel Aviv into a “smart city” affect how your destination engages with travellers or potential visitors? 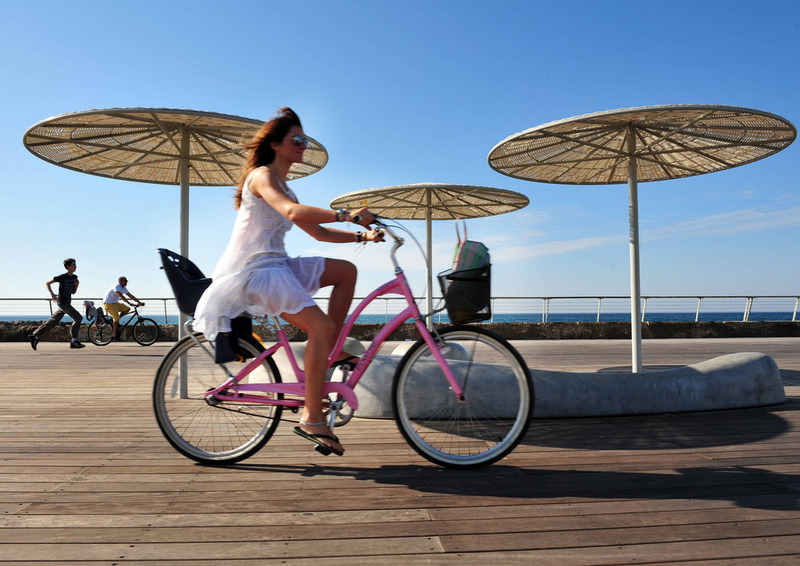 We try to build a seamless visitor experience for tourists in Tel Aviv. We have free Wi-Fi all across the city, including the beach, which tourists love. We share event and tourist info on smart TVs in city hotels. Our tourist information officers encourage visitors to download local apps for various needs, from questions about local attractions to restaurant bookings. We will always prefer for a tourist to leave the information centre with a new app downloaded to their device than with a brochure. We are not there yet, there are still some issues with basic elements like using public transport, which is not very tourist-friendly at the moment, but we are aware of that and work hard to change that gradually with other municipal departments. You’ve previously described Airbnb as a “win-win situation” for your destination. At a time when some cities are restricting short-term rentals, why do you think services like Airbnb can be an asset for Tel Aviv? I think that Airbnb can be an asset for any city, to be honest. It diversifies the accommodation offerings at the destination and allows many people who couldn’t previously travel to do so more often. That is a beautiful thing. For us in Tel Aviv, it helped a lot with younger travellers or millennial travellers, who used to skip Tel Aviv because it was too expensive. Our product is not the cheapest around and we currently lack budget accommodation options. Airbnb filled that gap. When I said it is a win-win situation I meant that when we as a DMOs collaborate with Airbnb it makes us feel more in control of the guest experience their tourists are getting, because Airbnb are open to share data and run joint activities to make guests’ stays more enjoyable. So the DMO wins and the tourist wins. And I guess Airbnb wins too! Having said that, we fully support the need to regulate Airbnb and believe it should be handled on a national level. In light of the constant changes in technology and tools for collaboration, how do you think the role of the DMO will change over the next 5 years? The “M” in DMOs will probably be replaced by something else, as we all know by now that our marketing efforts are less significant when compared to user-generated content and other types of earned media. I feel we will work more often with local communities and include them in tourism planning and promotion. We have started going in that direction and will involve city residents in writing our tourism master plan. We also give our Snapchat account for selected residents to manage, which gets great responses. I think we all need to be a bit more humble and realize that we are only the facilitators, not the bosses of the destination.